This Greek island, often referred to as Zakynthos, is named after the son of the Arcadian chief Dardanus. 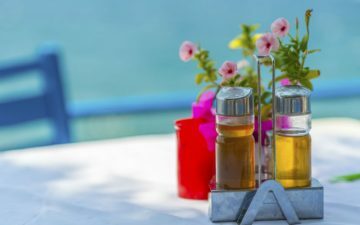 Zante is widely considered to be one of the best islands in Europe for a beach break, but it also has a lot to offer if you like to get out and about and explore too. Zante town is a great starting point for anyone who is visiting the island for the first time. Just over 60 years ago, much of Zante was destroyed by a large earthquake, but lots of work has taken place over the decades since the disaster to rebuild the town. Among the very few buildings that survived the quake is the church of Aghios Dionysios, which is the resting place of the patron saint of Zante. Perhaps it was divine intervention that spared the church from the disaster? 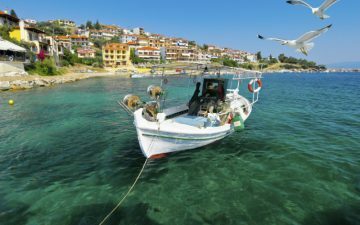 Small fishing boats arrive in Zante’s town harbour every morning and the catch of the day is fresher here than anywhere else on the island. Kambi is a little off the beaten track butr if you make the effort to get there, you will be rewarded with one of the best sights the island has to offer. The Kambi sunset is absolutely unforgettable, providing a memory you are likely to cherish for the rest of your life. It would be spoiling it to say why the sunset is so special in Kambi, but anyone staying in Zante should go along one night and take their camera – this is a truly unmissable experience. A series of cliff-top tavernas provide the ideal vantage point. Zante is famous for its many mysterious coves and inlets and perhaps the best of them is the Blue Grotto, which can be found at the top of the island, at a tiny peninsula, right by the tip of Zante. Waters here are perhaps bluer than anywhere else in the world. You can also marvel at a rich array of interesting rock formations at Blue Grotto, while various colourful marine life lie beneath the surface of the cool waters. 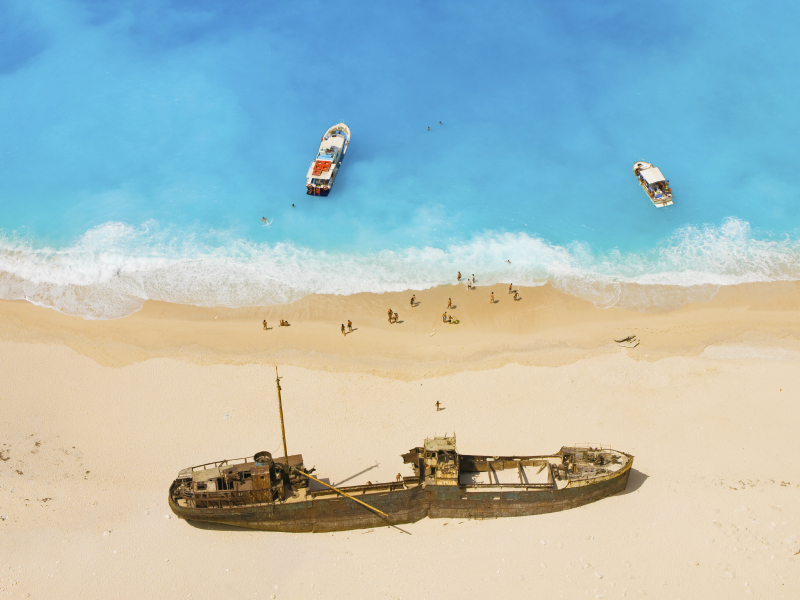 Finally, Blue Grotto has its very own shipwreck – this is definitely a place to put on your travel itinerary. 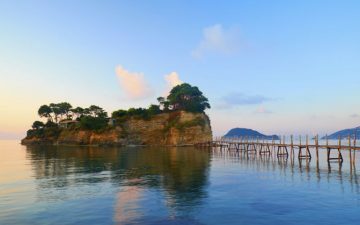 It is probably fair to say that Smugglers’ Cove is one of the places that Zante is best known for. Accessible only via boat, Smugglers’ Cove is reachable from nearby Porto Vromi and the site is famous for its alleged smuggler shipwreck. The spectacular scenery is so amazing it is no wonder Smugglers’ Cove features on many of the postcards people send home while staying in Zante. A trip to Smugglers’ Cove also features the chance to see the amazing Face of Poseidon cave, while the harbour side snack bar is the perfect place to grab a quick bite to eat. Marathonisi Island is the ideal place to go to for anyone who wants a touch of their very own paradise for the day, This uninhabited island located just a 20-minute boat trip away from Zante is a particularly good place to go for anyone who is staying near Lithakia during their holiday in Zante, as it is easily reachable from this part of the island. Marathonisi Island is small but perfectly formed and looks like something out of a castaway film, with its perfectly unspoiled beach and lush greenery making it a very special place in which to while away a few hours. The island’s other name is Turtle Island and a visit here also provides a fair chance of spotting these wonderful creatures. Keri Caves are great for exploring during your trip to the island.